How would you react if you received a notice that your income taxes were going up 5%, even though your income is the same or less than last year and living costs are increasing rapidly? If you had the opportunity to say “no”, would you? New year opens with a bang… This mailer provides snippets of information on the most active of these issues, but you can also read our articles in the West County Gazette and Russian River Times. 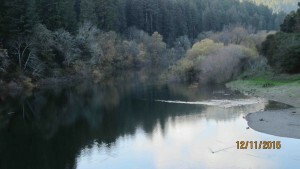 The Russian River’s running very low…..
Have you been to the river this summer? We visited Steelhead Beach recently (in Forestville) and watched a medium-sized dog standing in the middle of the river with the water coming only to his shoulders. That was in late June, when flows are generally much higher than in late summer. Between June 15th and July 3rd, 2008, flows at the Hacienda Bridge averaged about 125 cubic feet per second (cfs), which is the minimum required. (Average June flows for the last 45 years was 315 cfs, with 23 cfs the lowest average flow occurring in draught year 1977 and 1,418 cfs the highest in 1998.) In this very hot summer, we wonder if flows will go much lower during the recreation season? Water and wastewater issues are all converging now, some more imminent than others. Our little mailer letter can’t begin to address them all, let alone in depth. But we take pride in our ability to squeeze the essence of many local water issues into a compact two pages. We are always available to provide more detail to those who request it, but for now we will give you the rundown on a few of the most important developments. Santa Rosa’s wastewater decisions coming up….. Demands for Russian River resources have proliferated over the last several years at the same time all signs indicate that its impairments are getting worse. RRWPC is a very small group, but we do our best to maximize our influence through our consistent presence on these issues. We can’t cover all of them, we have to pick and choose carefully, so we usually go where we think the greatest need exists, often where few others are paying attention. This final mailer of the year gives a partial review of our work and also gives some projections of next year’s watershed challenges.